In Tools > Online Web Registration > Settings, there are 3 options available for you to control how new customers select schedule times when enrolling. A Schedule Template is an option of days/times that fall within the Class meet times but may not be for all days/hours the class is open. See Schedule Templates. 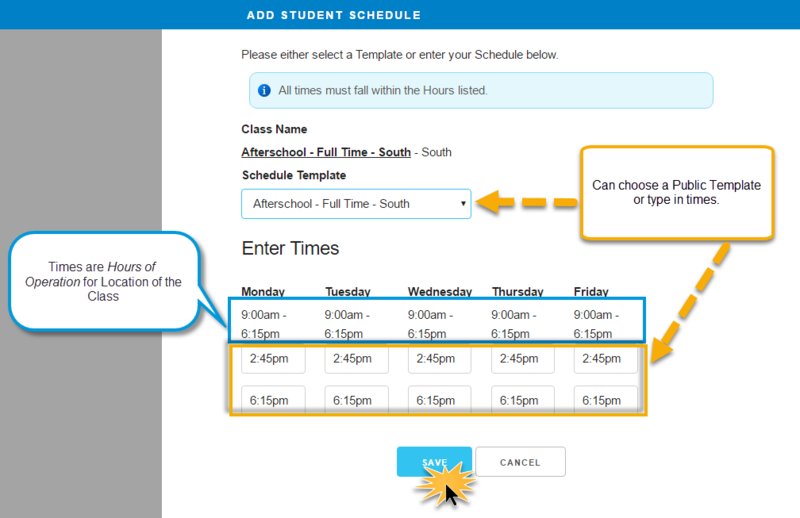 With the Require Class, Template Optional, Pick Times option, customers enroll in a class and may choose times from either Public Schedule Templates or by typing in days/times. Point to Tools and select Edit Settings then click Schedule Templates from the left menu. Mark all Schedule Templates as Public = Yes if they should be available for parents to choose from during registration. Only Public Templates will be available for selection during registration - Assigned Templates do not apply. Template names should be descriptive to parents. Class is selected by clicking Select Class on the Web Registration Form and choosing one from the Class Search area. If set, age and gender filters apply. Registrant is returned to the Registration Form where they can choose an option from below the Select Schedule drop-down. OR registrant can enter In/Out times for the days they want to attend. Note: Times entered must fall within that Class Location's Hours of Operation (if set). Clicking Save allows the registrant to continue registration. Edit Times may be selected to change the In/Out times or template. The Schedule Start Date is always the day they enroll in the class. This makes the student active and takes a spot in the class. School administrators can change this by deleting and re-entering the schedule in Jackrabbit.